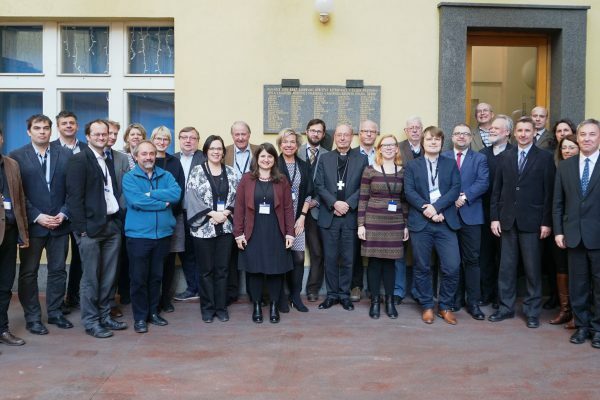 “Developing ecumenical relations is the genuine contribution of churches to building a common European home” was the conclusion of the regional meeting of Central and Eastern European churches in discussing the Future of Europe. Representatives from 20 different churches and ecumenical organisations from countries in the Central European region and other parts of the continent met from 30 November to 1 December in Prague, Czech Republic. The conference was part of the Future of Europe consultation process launched by an open letter of the CEC to churches in Europe last year, which also forms an important part of the preparation for CEC General Assembly 2018 in Novi Sad. Prof. Beres underlined that “when tackling the crisis, it is important to emphasise that values, including Christian values, are not static but a part of a dynamic process.” In stressing the “activity of faith” in the daily life, he underlined that the most effective tool of Christianity needs to be credibility and oikumene. CEC President Rt Rev. Christopher Hill highlighted the historical lines along which Europe is built on; Roman organisation, Christianity and separation between religion and state, and how they played a key role in shaping today’s Europe. Petr Jan Vins, General Secretary of the Ecumenical Council of Churches in the Czech Republic and Pavel Cerny, President Emeritus of the Council shared lessons learned from history. They stated that: “Secularism and materialism is the main religion in the country.” At the same time, they witnessed good ecumenical cooperation among churches, which has been characterised as “ecumenism of prayer, action and blood” referring to a shared history of persecution and suffering, which churches in the country had to overcome in the past. Contributions of representatives from churches in several countries of the region highlighted the diversity and richness of the region. Along with secularism and materialism, the positive contribution of ecumenism and a wish for an “ecumenism of values” was highlighted. As for the situation of migrants and refugees in the region, many stressed the need for a wider discussion considering the many positive activities of churches, as well as challenges specific to central Europe, for example substantial immigration to the region coming from the Eastern Europe. In view of the upcoming General Assembly of CEC, churches from the region underlined their wish that CEC will strengthen its role as a platform for a dialogue and sharing on challenges, as the gospel in the daily life, humanisation of economy and ethical questions, as well as in providing space for a promotion of ecumenism of values. A substantial role needs to be given to public theology discovering new ways for addressing individual and society in postmodern age. The next Future of Europe consultation organised by CEC will take place in Brussels on 13 December.